There was an interesting knock on the door this weekend. A young man said he was from Angus Steaks and that they had a surplus of steaks and fish, still frozen in the cooler in the back of his truck, did we want to buy any? Um…no? Who buys meat from the back of a truck? No, no thank you. But in many parts of the world, this is an acceptable practice. It reminded me of the day I was in Thailand and had to go to the Burmese border to renew my Thai visa. The group made a stop at a small village. As we were walking around, we heard the driver of the truck in this picture beep his horn as he approached the village. He parked and waited. We did too. What would happen? What’s for sale on this truck? Women and children came out of hiding and purchased produce, fish, dinner for the evening. Like any child in the world, the little ones begged for sweets and toys. This mobile grocery store carries everything! At the time, I remember thinking that it was a nice benefit of living in a remote village – the market comes to you! So why oh why did it seem so unnatural this weekend when that young man came to the door selling steaks and fish? Yeah, yeah, I know. We just don’t do that here. Why not? 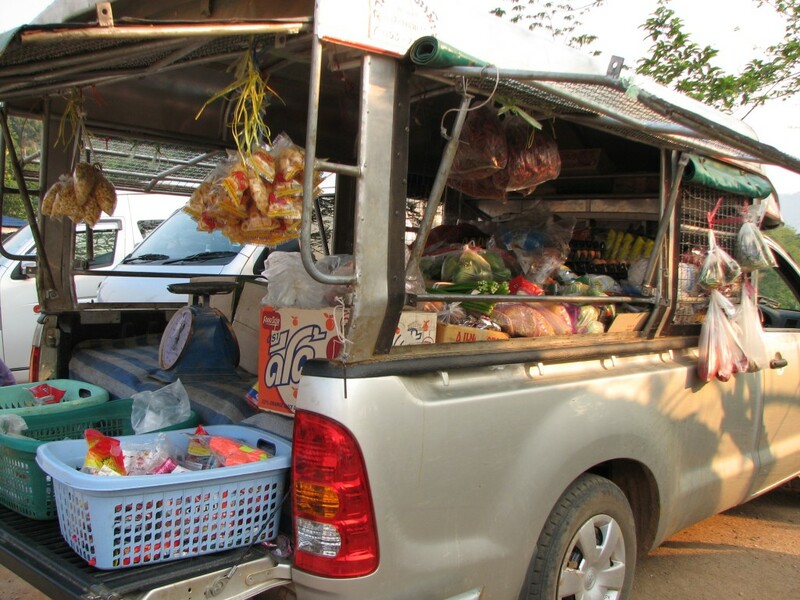 Wouldn’t it be cool if the local farmer’s market had a mobile unit that came to your neighborhood everyday? I think it’s a brilliant idea!